The announcement of the dormancy of the Defenders comes on the heels of a league merger and a second straight sub-.500 performance in the 2014 season where the team finished 4-9 overall and missed the playoffs for the second straight year. Overall the Defenders posted a record of 16-20 in three seasons. The team went 3-9 in 2013. The teams’ best year was their inaugural season where the Defenders played in the now-defunct American Professional Football League (APFL) where they posted a 9-3 record and lost in the semi-final round of the playoffs. The week before the Defenders announcement, the Champions Professional Indoor Football League (CPIFL) had announced a merger with the Lone Star Football League (LSFL) and formed the CIF. 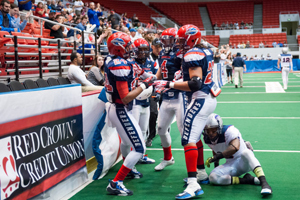 The CPIFL had teams in Oklahoma, Kansas, Nebraska and Illinois and the LSFL’s teams are based in Texas. There was some early suspicion among Defenders fans and league observers that the team was on shaky ground after the team’s website went dark earlier in the summer. Indeed, the only thing that came out out of the organization since the end of the CPIFL season was information about the Defenders Youth Football Association, which is a youth football league that plays in south Tulsa. Defenders officials have remained silent since the announcement and have been unavailable for comment. 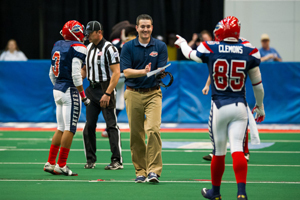 The demise of the Oklahoma Defenders marks the second team of indoor/arena genre to close up shop in four years, the other being the abrupt and questionable departure of the Arena Football League’s Tulsa Talons in 2011. Unconfirmed reports have surfaced that there is a possibility that indoor football could be played in 2015, with new ownership taking over the Defenders franchise or possibly an entirely new team, but that seems a long shot at this point. This entry was posted in Sports on August 28, 2014 by admin.